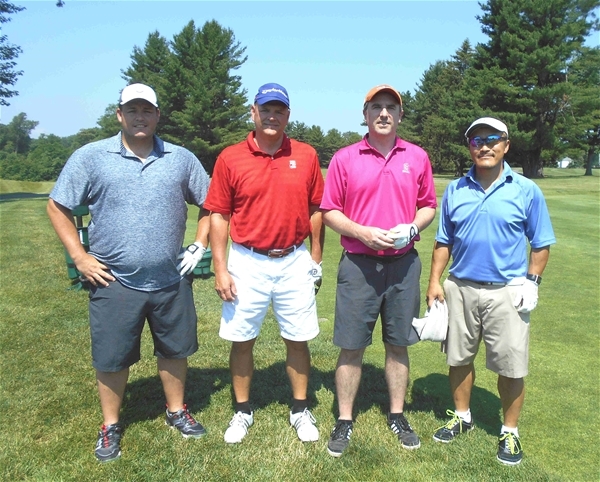 Brian Lynch, Mark Butterfoss, Ed Kelly and Phil Yang enjoy the beautiful DuPont (Nemours) Course. DuPont Country Club’s Nemours Course was the venue for the fourth tournament of the season on Monday June 12th. Sixty members and guests competed on the challenging Par 71 parkland course for trophies in 5 flights. The Nemours Course was built on the grounds of the family’s Brantwyn Estate in 1937 for the enjoyment of DuPont family and friends; it was later incorporated as part of the golf club. Although somewhat short compared to modern standards, the course features narrow fairways, thick rough, and sloped undulating greens that challenge every approach shot. Thirty-two Philly Metro members who had competed the previous Saturday at White Clay Creek Country Club in Wilmington were involved in a secondary competition – The Delaware Double Play – with the lowest combined gross score in each flight winning a crystal trophy. In the Championship Flight, Matthew Perrino (72, 37-35) coasted to victory with a stellar one-over par round and in the process claimed the Delaware Double play as well. Great playing, Matt! CHAMP Flight played Blue Tees at 6,230 yards. The A Flight winner was Steve Barry (76, 38-38), who was a two-stroke winner over Carl Handwerk (78, 39-39) and George Steinmetz (78, 38-40). Handwerk took 2nd place on a scorecard playoff (back nine). The A Flight also played Blue Tees at 6,230 yards. Michael Dupree claimed The Delaware Double Play trophy in the A Flight. Lou Parducci (79, 38-41) continued his torrid weekend play and won the B Flight two-strokes over new member Greg Ricker (81, 38-43). Steve Winnick (82, 41-41) was another stroke back in 3rd place. Lou Parducci also claimed The Delaware Double Play trophy. The B Flight played Blue/White Combo Tees at 6,101 yards. In the C Flight, new member Lynn Bigelow (85, 43-42) claimed his second title of the season by two-strokes over Jim Donnelly (87, 43-44). Another stroke back was Andrew Repetto (88, 44-44) and Ken Burczynski (88, 42-46). Repetto took 3rd place in a scorecard playoff (back nine). The C Flight played White Tees at 6,034 yards. Art Laney claimed The Delaware Double Play trophy in very close contest. The D Flight winner was DC Metro member Ron Brown (89, 42-47) by three-strokes over Sean Matthews (92, 45-47). Robert Kerr (95, 44-51) was another three-stokes back in 3rd place. The D Flight also played White Tees at 6,034 yards. Sean Matthews took home The Delaware Double Play trophy. CTP #9 – Sean Matthews - 4' 7"
CTP #12 - Mark Butterfoss - 1' 0"
CTP #15 – Michael Dupree - 15' 4"
CTP #17 - Brian Lynch - 1' 0"